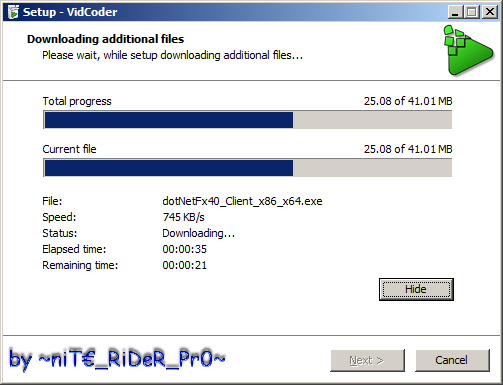 VidCoder is a very easy to use DVD, Blu-ray and any video file to MP4/MKV video converter. It uses HandBrake, the most powerful encoder, as its encoding engine. Easily batch convert your video/DVDs/ISO/VIDEO_TS and Blu-ray to MP4 or MKV. Burn-in/Hardcode srt subtitles. Multi-threaded, H.264/AVC encoding with x264 and H.265/HEVC with x265, the world's best video encoder. Completely integrated encoding: everything is in one process and no huge intermediate temporary files. Requires .NET 4 Client. Installs 32/64bit version according to system architecture automatically. VidCoder requires .NET Framework 4.0. This RePack checks if .NET Framework 4.0 is installed in the system, and if it is not found, then it prompts the user to download and install automatically (within the installer). Compressed installer size from 24MB (size of 32+64bit installer) > 17MB. /VERYSILENT /NORESTART /SUPRESSMSGBOXES /SP- : Fully-silent automated background installation, no windows are shown, no user input is required. /SILENT /NORESTART /SUPPRESSMSGBOXES/SP- : Silent automated (passive) installation, only progress window is shown, no user input is required.